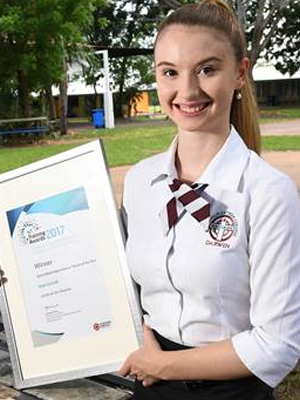 Kate Gornall, 18, has been honoured with the Year 12 Vocational Education and Training Award. Graduating O’Loughlin Catholic College with an ATAR of 90.9, Kate has landed a job with Australian Apprenticeships NT, where she will be working as a gateway marketing officer. Her final school year consisted of three days of school, and two days of university. Kate has struggled with dyslexia since she was eight, making her achievements even more impressive. Kate was headhunted by Australian Apprenticeships NT after attending the Australian Training awards. Her role now is to help apprentices in the Territory find jobs – exactly what she was trying to do just months ago. “We interview apprentices and trainees, aptitude test them, and find a business best suited to the apprentice and the company,” she said. During her final year, Kate trained with the NT Office of the Commissioner for Public Employment and won the NT School Based Apprentice or Trainee of the Year Award.